“Are you sure it’s the right place?” No, I wasn’t. It was the kind of strip mall you could cruise by a thousand times without bothering to take a second glance. Though sparkling clean and brightly painted, the row of stores seemed forlorn and dejected, like an aging wallflower who knows she’s not winning any beauty pageants. A carpet cleaner. A beauty salon. A bar. A gun shop. No restaurants in sight. “It’s got to be here! 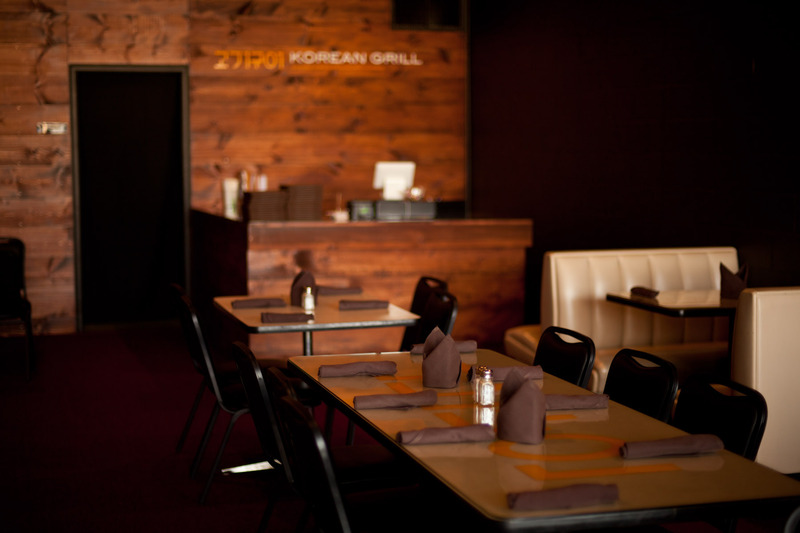 Look, let’s drive to the end of the row.” And there it was, a hidden road, a second row of stores, a brightly polished plate glass window with a discreet sign painted on: “Korean Grill”. Step inside, and it’s a different story. Sleek, modern, professional. The wood-paneled walls are inviting and polished to a mellow glow. A server hurries over to welcome us. He’s young, eager, and, like the decor, very professional. “We have an appointment to see the owner,” I say. “Ah yes, he’s expecting you.” And a moment later out steps Samon Xiong. Burly, confident, his bulging arms covered in bright intricate tattoos, he’s the very image of a professional wrestler ready to obliterate all opponents. Yes it’s different from the traditional recipe. But it’s the sort of subtle yet dramatic improvement that only a chef long trained in tradition is qualified to make. And Samon’s brother and chef Saya, who incidentally has a criminal justice degree from Portland State University, is indeed that. “He’s had ten years training,” says Samon, “cooking in Korean restaurants in Los Angeles.” Now, those guys are extremely strict and very traditional. For Saya’s first three or four years, he was an apprentice, and his whole time was spent cooking just one dish (bulgogi) until he got it perfect. Then they trained Saya to cook rice. You wouldn’t think you’d need training in that particular skill. But rice, Samon explains, is very important to Koreans; they use a special short-grain rice, slightly sticky, and it has to be done just right. After that training, they believed he was ready to learn and master the kimchi. Kimchi, a pungently flavored dish made from fermented Napa cabbages, is Korea’s signature dish. 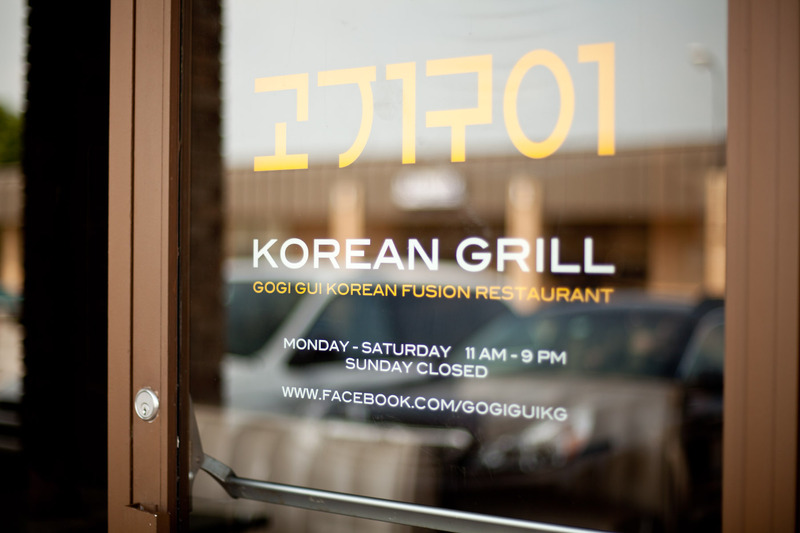 For Koreans, it’s what burgers and BBQ and apple pie mean to Americans: the taste and soul of their homeland. It’s not easy to make. I didn’t see Saya until the end of the meal, when he stepped out of the kitchen to say a brief hello. By then I was dazed and dazzled by a plethora of his delicious dishes, so I didn’t say much – except to express gratitude for a great meal. 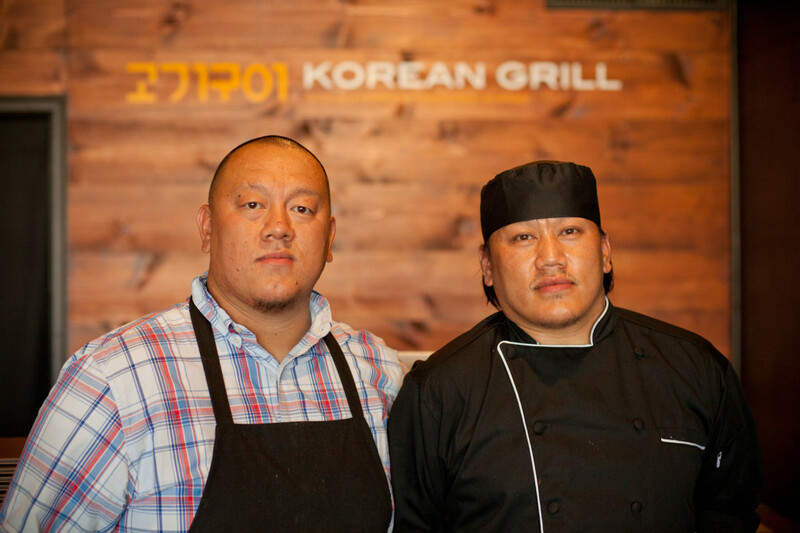 We were enjoying enjoying these Korean tacos as Samon told us about his inspiration to bring this cuisine to Tulsa. It’s superb. 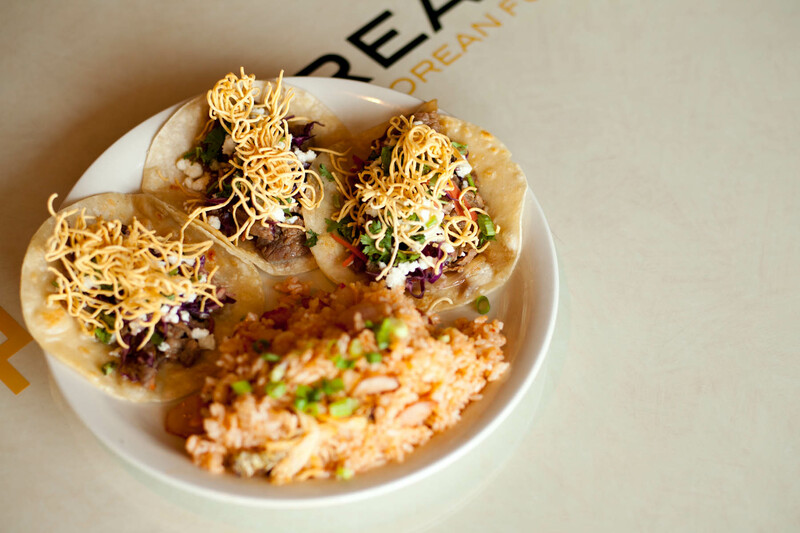 The Mexican cheese and funky corn tortilla are the perfect marriage for the Korean beef bulgogi filling. “Those tacos were the best dish of the night,” said TulsaFood photographer Valerie as we left. Though there was another dish she loved too. “Look they have bubble tea!” Valerie exclaimed when she first saw the menu. I was thrilled and pleasantly surprised also. 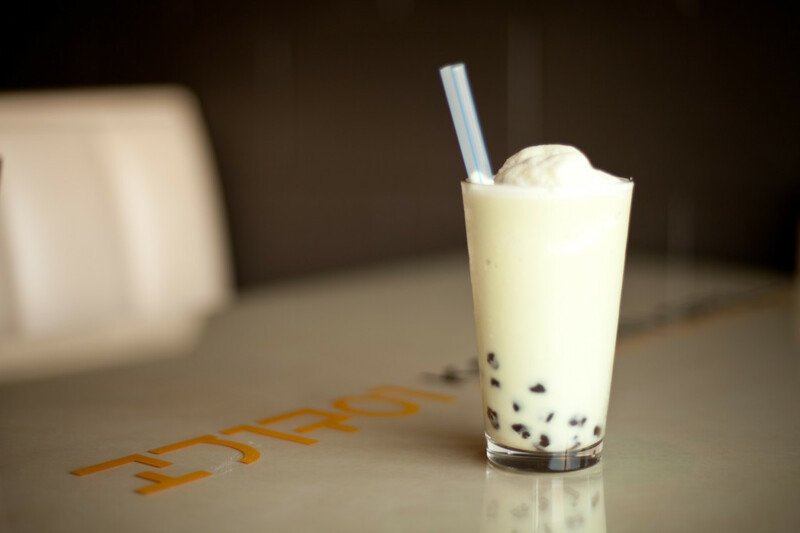 This is a Taiwanese treat that’s very popular in New York. Many people have asked me if they have it in Tulsa and I’ve had to answer “no sorry, we don’t”… until now. It’s actually mostly not tea. It’s a frothy milkshake concoction with little “pearls” of tapioca at the bottom. 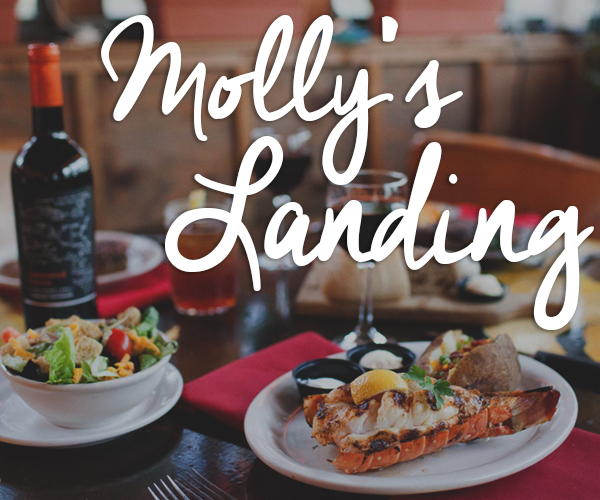 “We make our pearls in house, by hand,” the server tells us. Plenty of exotic flavors: taro, honeydew, coconut, durian. Valerie chooses cantaloupe. It’s delicious! It’s sweet and lovely with a sprightly melon flavor. They told me they don’t use fresh fruit, but it sure tastes like they do. OK, Let’s back up a bit. 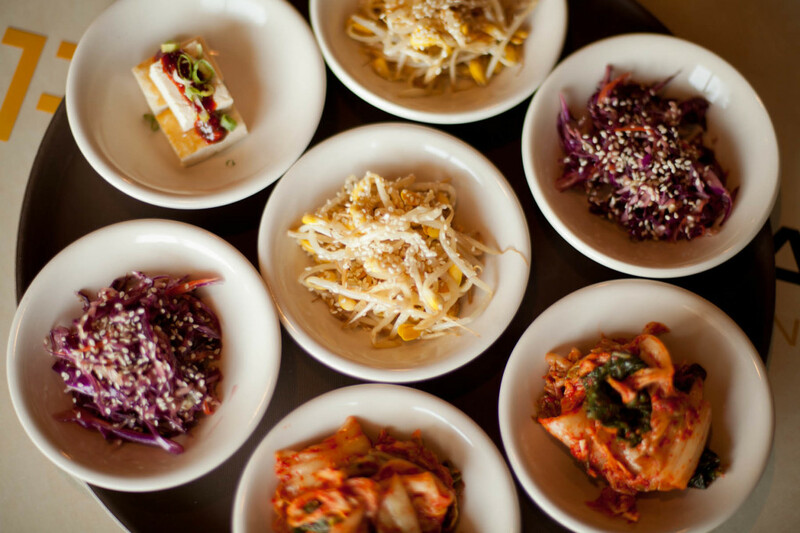 The first, and most beloved, part of any Korean meal is the banchan. That’s a little array of appetizers, a lot like mezze but much more intricate, that ushers in the meal. The kimchi was wonderful. Saya is truly a master of kimchi preparation. The white cubes are little blocks of tofu with a chili sauce. Then there’s kongnamul. That’s bean sprouts, peeled boiled drained and seasoned. (Since namul means steamed, they might have been steamed instead of boiled.) They had a rich earthy taste. And the purple thing is sesame cabbage, kind of a Korean cole slaw. All excellent. As for the rest of the meal, the galbi ($14), those pear and honey-marinated short ribs, they were a delight. Rich, juicy, and I managed to grab most of them. 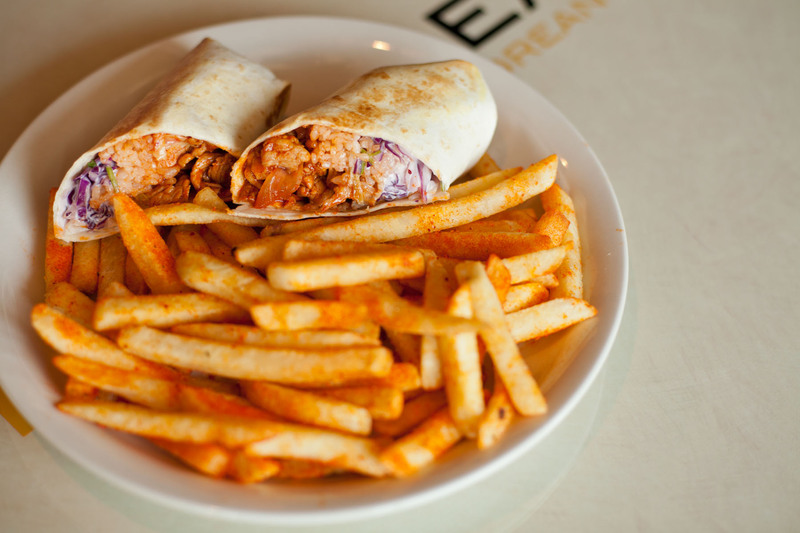 Betty, one of the gals in our party, got a Gogi Burrito ($10). It’s Pork Donkatsu ($14). I’d always thought of this as a Japanese dish, and in fact I had a nice version at Fuji Sushi on Brookside (where it’s called a katsudon, though the usual Japanese name is tonkatsu). 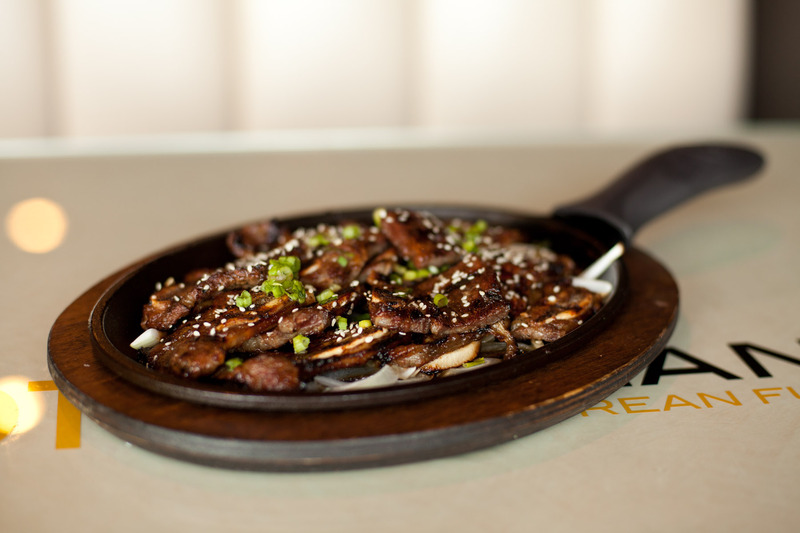 But it’s become a popular dish in Korea, making it perhaps the only Japanese thing Koreans love. Being lazy, I’ll offer the menu description: “Crispy panko on the outside and tender on the inside. 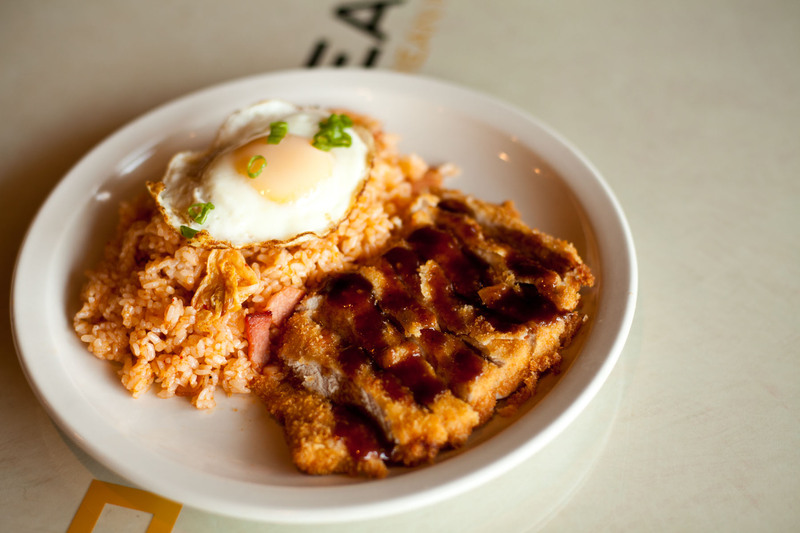 Pork battered in panko and deep-fried until golden brown, drizzled with a special Katsu sauce and deserved with Kimchi fried rice and a sunny side up egg.”Panko are bread crumbs and katsu sauce is the traditional Japanese sweet and tangy accompaniment to this dish. In short, it’s chicken-fried pork. But, it’s not like the Japanese version; “we use a different flavor profile,”Samon assures me. And yes, it’s another winner. Sweet and lovely and delicious. What a great meal! 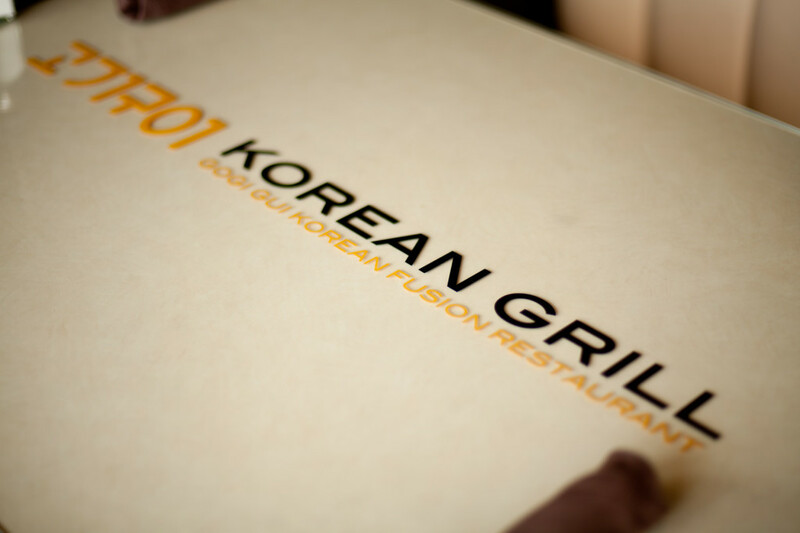 I have only one regret: Being to full and satisfied I did not get to try that special Korean rice. But, for a place like this – there is always a next time.